Last year, many months ago, I planted carrot seeds with my brother in the garden bed he had started in the backyard. 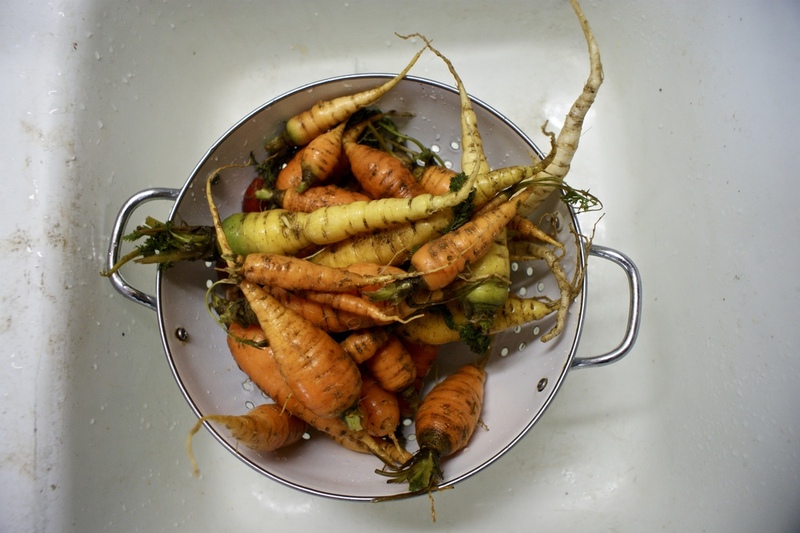 As the space wasn't optimal for growing carrots, their cultivation was slow-coming. We pulled up a few around normal harvest time, but they were just tiny little carrot sproutlings. The rest remained growing. My brother left the nest for college, & his garden was left unattended and unharvested for some time. The carrots sat until I decided to take action, the day spring introduced itself once again. Instead of doing my homework, I weeded the garden bed and pulled up all of the remaining carrots. Some had been eaten by underground creatures, others were usable. After washing them once, I soaked them in a bowl of water for the next few days until I had time for cooking + prep. After straining them, I scrubbed + rinsed dirt from each and cut off their ends. Next, I chopped them into sizable pieces. These carrots have an extremely potent, almost bitter flavor. As they likely wouldn't be eaten raw, I knew the best way to utilize them was to roast them. I preheated the oven to about 415 degrees. In a medium mixing bowl, I poured in some olive oil and mixed the pieces until they were covered. My original plan was to pair the potent carrots with the loudness of plenty of fresh rosemary, but we had none. So I improvised. I sprinkled a little cinnamon, some ginger, and of course kosher salt and cracked pepper. Mom found a dried up sprig of rosemary somewhere between our house and the neighbors', which I added to the mix. I threw them onto a baking pan, also deciding to add some golden beets I sliced for variety, then into the oven. I didn't set a timer, but would estimate they roasted for around 30 minutes. After checking on them a couple times, and took them out as they had become soft and golden/ browned on the edges. Root vegetables go well paired with a meats, beans or legumes, and greens. This particular evening, my toilsome carrot roast was paired with my dad's grilled chicken and sautéed kale. Normally, this side to a meal is very simple! Grab a bag or bunch of fresh carrots at your local grocery. Wash (peeling is unnecessary), chop, season, bake, and enjoy them around the table!